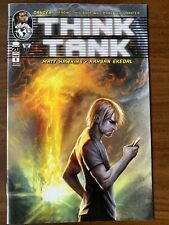 Think Tank #1 2012 Variant Comic Book. Less than 500 made. 2 Sigs. NM! Think Tank #1 2 3 4 5 6 7 8 9 10 11 12 SET & Military Dossier (2012 Image) - NM! This page was last updated: 22-Apr 09:49. Number of bids and bid amounts may be slightly out of date. See each listing for international shipping options and costs.